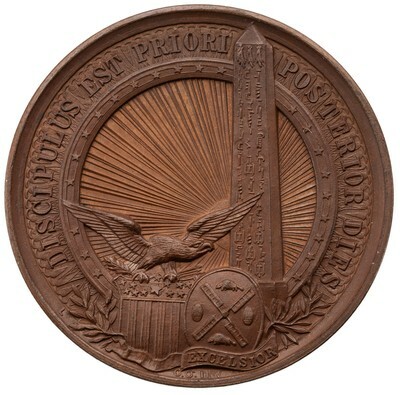 Obverse: DISCIPULUS EST PRIORI POSTERIOR DIES; at bottom,signed C. O. INV - Egyptian obelisk, sunburst behind; below, arms of the United States, surmounted by an eagle, and arms of New York City to right. 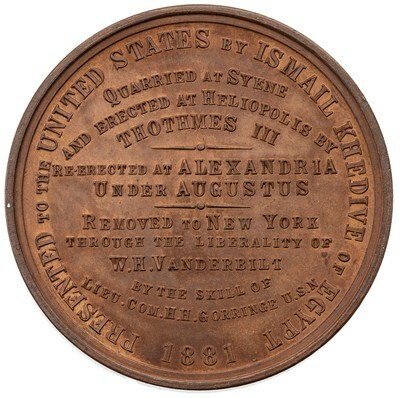 Reverse: Around, PRESENTED TO THE UNITED STATES BYISMAIL KHEDIVE OF EGYPT / 1881; in center, ten-lineinscription: QUARRIED AT SYENE / AND ERECTED AT HELIOPOLIS BY / THOTHMES III / RE-ERECTED AT ALEXANDRIA / UNDER AUGUSTUS / REMOVEDTO NEW YORK / THROUGH THE LIBERALITY OF / W. H. VANDERBILT / BY THE SKILL OF / LIEU. COM. H. H. GORRINGE U.S.N - Twelve line inscription. Note: Hitherto unknown in bronze.